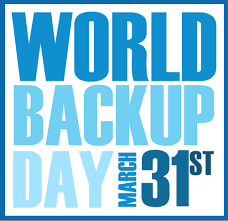 March 31st is World Backup Day! It is a day for people to learn about the increasing role of data in our lives and the importance of regular backups. This is an independent initiative to raise awareness about backups and data preservation! The creation and maintenance of a current set of backups is the first and most critical part of your computer’s preventive maintenance. Without backups, data recovery can be very expensive and, unfortunately, in some cases impossible. The primary storage component for your operating system, programs, and files is your computer’s hard disk drive or solid state drive. Hard disk drives provide magnetic storage of your data and are relatively robust. Most hard disk drives have life spans of five years or better but all those moving parts, from stepper motors to read/write heads, can fail at any time leaving your data locked in a proverbial steel tomb. Additionally, there are malicious programs, often delivered through email attachments, which can encrypt your pictures, documents, and files, leaving them completely inaccessible. Solid state drives, propelled by the technological advancements, are small light-weight devices with no moving parts. Like a flash drive (or thumb drive), solid state drives rely on transistors situated on a thin oxide layer to store your data. Voltages exceeding the thresholds of these oxide layers, including static electricity, can cause catastrophic damage to the layers destroying the flash memory devices. Unlike hard disk drives which often emit growls and death rasps before their failure, solid state drives tend to just stop working. Without warning, you could lose your important documents, pictures, and files. Backups are therefore essential. Backups can be completed to local external drives, cloud-based storage facilities, or both. Windows operating systems offer a File History utility that allows you to schedule backups to a local external drive and recover or restore files at any time. Most external backup drives also come with their own software that can be used to create and schedule backups. Lastly, several companies offer cloud-based backups that store your data files off-site in a storage facility for a monthly subscription fee. If you have questions about backups or need help setting up your backups, feel free to contact us!